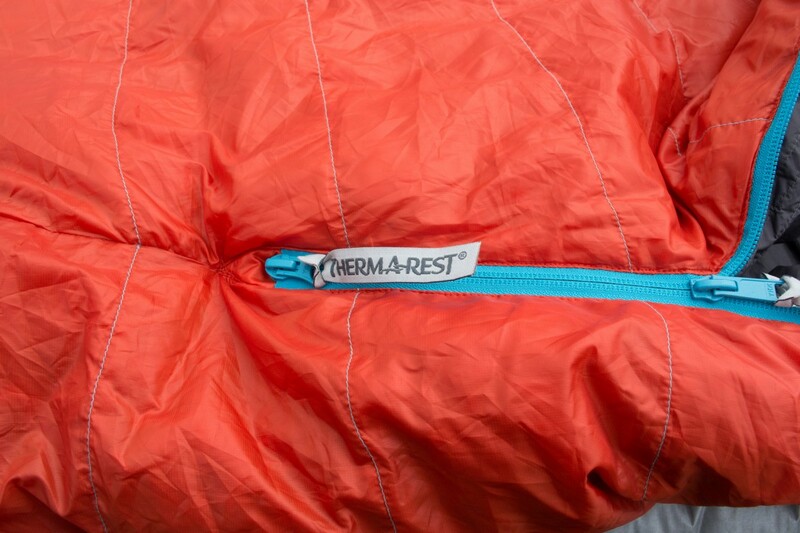 Therm-a-rest’s new Antares series sleeping bags are designed to pair up with Therm-a-Rest mats. With the SynergyLink straps, the bag is held in place against the sleeping mat, eliminating issues with the bag slipping and twisting for restless sleepers. The bag also features a reflective liner and Nikwax branded hydrophobic down. I have tested the Antares HD for Autumn Winter 2015. At a weight of 890g the Antares HD is quite lightweight for a three season bag and it packs down well, either in the supplied stuff sack or in aftermarket compression bag. While the down is hydrophobic, I always opt for the extra protection of a Sea to Summit eVent compression dry sack. It achieves greater compression than manufacturer supplied sacks and also provides the reassurance that your down bag will be completely dry regardless of how soaked your pack might get on the way to camp. The Antares HD has a comfortable, yet not excessively roomy cut. Some bags such as the Alpkit Pipedream achieve a greater temp rating at the expense of comfort by cutting a more snug fit. The Antares feels like it achieves a balance of being snug enough to stay warm, without being so constricting as to prevent comfortable sleep. This is important given the design of the Antares HD. When using the synergy link straps, the bag will not roll as you do. Thankfully there was sufficient room for me to roll onto my side, without the bag feeling stretched or tight. The foot box is well shaped and doesn’t feel like your feet are being pressed down or back towards you while sleeping on your back. The Antares does not use a full length zip, instead opting for a 3/4 length zip starting at the neck and ending roughly around the calfs. I have found this to be a problem sometimes with other bags, as it results in too much twisting around when getting out of your bivvy briefly in the middle of the night. Thankfully the SynergyLink straps keep the Antares straightened out, avoiding the usual tossing and turning to get comfortable after returning to your bivvy. In a tent this is of course much less of an issue either way. The shorter zip might be a concern if you’re the kind of sleeper who likes to throw their feet out of the bag to cool down during the night. Due to the relatively low fill weight of the Antares, therm-a-rest have been smart about down placement. The down is maximised in the upper bag, with the bottom relying on the mat for insulation. This approach seems intelligent enough for a bag whose bottom will remain permanently fixed to the sleeping mat. Down on the bottom of a sleeping bag would be compressed under the weight of the user and therefore confer little warmth anyway. It is worth noting that if you opt to not use the SynergyLink straps, you may feel cold when turned onto your side due to the lack of insulation on the underside of the bag. When the straps are in use this isn’t an issue. The Thermacapture reflective foil lining seems very effective at retaining body heat, however I have observed a tradeoff compared to other down bags in terms of breathability and comfort. The foil lining gives the bag a crinkly, rigid quality which is much less comfortable than the fluffy softness which is the norm for down filled bags. Sadly this is exacerbated somewhat by the choice of 20 denier polyester for the inner lining, which has quite a slick, shiny feel to it. While the polyester is certainly robust, it tends to feel “sweaty”, worsening this bag’s breathability issues. A poly cotton blend might have improved comfort in this respect, but it’s not so much of a concern if you intend on sleeping in a comfortable base layer. Whether or not these concerns will be an issue for you depends on priorities. The Antares HD achieves an impressive warmth considering its fill weight. This is in part due to the inclusion of the reflective liner. The trade off involves a little less tactile comfort in exchange for good warmth at night, with smaller pack size and weight during the day. The hood is comfortable, although its draw cord can be a little fiddly. The shoulder and neck baffles are generous and do a great job of keeping the heat in and the draughts out. I have found the SynergyLink straps to be an interesting feature, but not one which is always suitable for me. I use a bivvy bag for almost all of my camping. When setting up in dry weather, the SynergyLink straps are a fantastic feature. I can take the time to fit my sleeping bag to the mat before placing in my bivvy bag. This really has been helpful, avoiding the hassle of having to reach down into my bivvy where I can’t see to straighten out a twisted bag. Sadly, if it’s raining while I’m setting up, it’s not practical to try to attach the bag to my mat, doing so would get both the mat and the sleeping bag very wet. 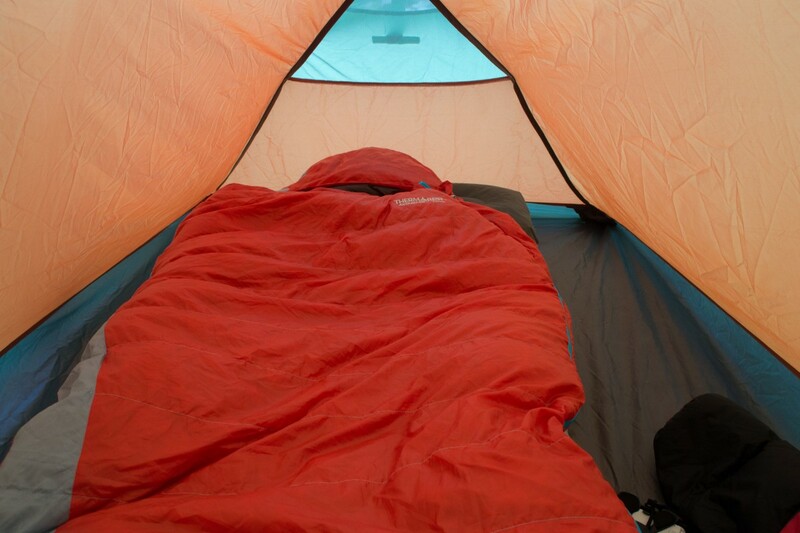 This isn’t an issue when using a tent, however straightening out your sleeping bag is a piece of cake anyway. If you’re a restless sleeper who tosses and turns a lot, frequently rolling off your mat – and you use a tent – this bag will definitely make your life easier. The Antares HD is an interesting and innovative bag with some useful features. The Thermacapture foil lining helps the bag feel much warmer than its weight would suggest, albeit at the expense of some breathability. Other bags at roughly the same price point achieve this by including higher fill power down, which is a more comfortable approach, negating the need for a foil liner. Given the bag’s price point, a higher fill power down such as the 900FP found in the PHD Minim 400 would be welcome. Higher FP down in concert with a foil liner might allow a bag like this to seriously punch above its weight, rather than compensating for the use of lower FP down. The water repellency of the hydrophobic down may be helpful in certain damper conditions, but we still would recommend doing everything you can to keep a down bag dry. 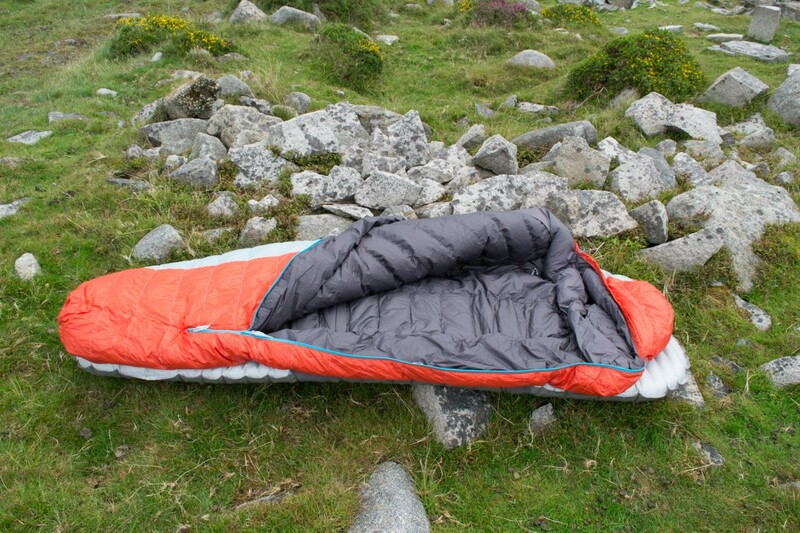 The SynergyLink connectors help avoid twisting of the sleeping bag during the night and keep you firmly placed on your mat where the comfort and insulation are. If you are a restless sleeper this feature is a definite plus. For those who use a bivvy bag this feature is even more beneficial, provided it’s dry enough for you to make use of the straps when you’re setting up. When packing away it’s easy enough to push a deflated mat down to your feet and slip the bag off it without leaving your bivvy. 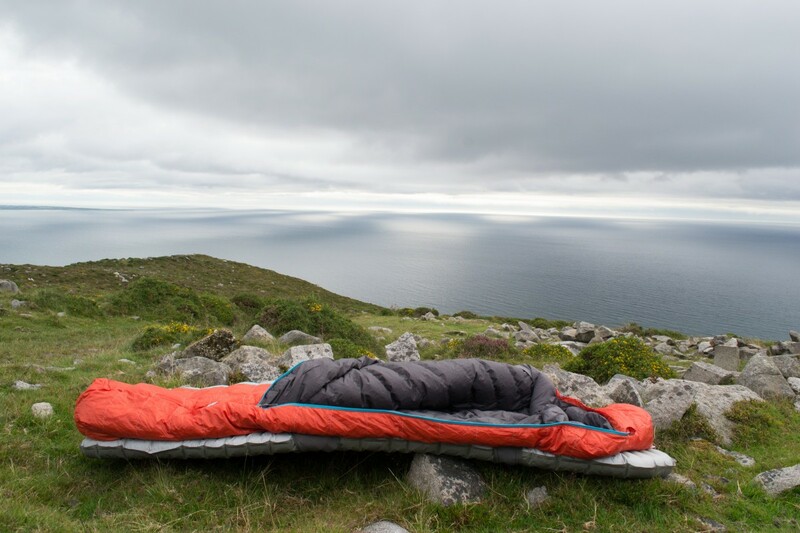 The Antares HD is commonly available online for around the £300 mark and it’s a great value bag at this price point, but only if you’ll make use of its innovative SynergyLink feature for staying on your sleeping mat. If this is something you won’t be using, other bags with a higher fillpower can achieve the same warmth at the same weight, without the drawbacks of a foil liner.